WataugaWatch: Put the State Bureau of Investigation Under GOP Control? Put the State Bureau of Investigation Under GOP Control? WRAL is reporting that a signal flag has gone up the Raleigh flagpole ... to move the State Bureau of Investigation (SBI) out of the Attorney General's balliwick and give it to one of Gov. Pat McCrory's political appointees in the Department of Public Safety, that is, one Kieran Shanahan (about whom, more below). This would be another Republican power-grab of the same species as the other current bright idea of firing all the members of several important regulatory boards and replacing all of them en masse with "team players." It's actually not a new idea. It surfaced first in 2011 when the Republicans first took control of the General Assembly. It was a bad idea then. It's even worse now. Which brings us again to Kieran Shanahan, the man who would have his mitts on the SBI, instead of Attorney General Roy Cooper. Shanahan touts this as his personal motto: "Don't bring a knife to a gunfight." To prove how tough he is, he once roughed up two pre-teen neighbors, was found guilty on two counts of "misdemeanor assault," and got off with a "prayer for judgment continued," the dodge of many a college student with a speeding ticket. 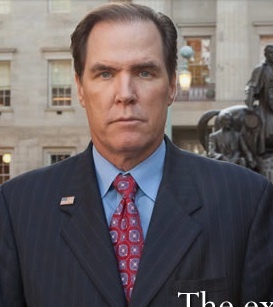 He's a former federal prosecutor and a former Raleigh city councilman. A partisan Republican to the core, he took what some might consider an unseemly, lip-licking interest in the prosecution of former Sen. John Edwards, showing up every day at the trial in Greensboro and then becoming a kind of commentator media whore, spouting off about the trial in front of any camera. Fox News used him repeatedly as an expert. For a man who prefers a gun to a knife (see above), he sure likes to watch Democrats (in particular) bleed. And some people want him to be in charge of the SBI. The SBI lab has done such a wonderful job under Democrats. Why on earth would anyone want to move them? How many cases have been throw out due to poor or other wise unprofessional work that did not follow scientific procedures standards? Any scandals in the SBI you seem to have over looked JW? You are a piece of work. No honesty. Either partisan faction will mess up -- badly.